There are approximately 40 species of mangroves distributed worldwide. Forty species of mangroves dominate approximately 75% of the world’s tropical coastlines between 25° N and 25° S. In certain locations, this range extends beyond these limits due to the movement of unusually warm waters from the equator. These areas include the east coast of Africa, Australia, and New Zealand where mangroves occur 10-15° farther south. 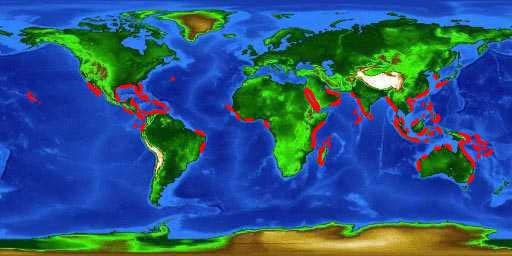 In Japan, Florida, Bermuda, and the Red Sea, this range extends 5-7° farther north. Mangroves in the Indo-West Pacific are more diverse, consisting of more than 30 tree species, than those in Florida. Three species of mangrove along with the buttonwood are found along Florida’s coasts. Only three species of mangroves occur in Florida, along with the buttonwood, which although not a true mangrove, is still an important tree in these communities. Red and white mangroves can be found as far north as Cedar Key in the Gulf of Mexico and Ponce de Leon Inlet on the Atlantic coast. Black mangroves may be found even farther north to Jacksonville on the east coast and into the panhandle in the gulf. This range is extended past that of the red and white mangroves due to its ability to grow from roots after freeze damage. 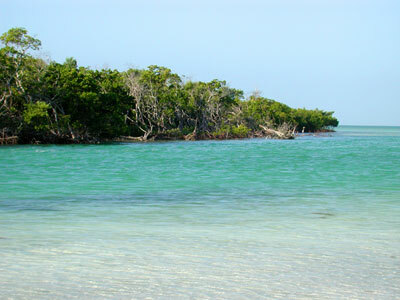 The Ten Thousand Islands in southwest Florida has the highest concentrations of mangroves in the state.